After a morning of drip-fed images, RED just went official with its DSMC (Digital Stills and Motion Camera) System. The system starts with your choice of the professional Scarlet or "master professional" EPIC brains which can then be bunged into about 2,251,799,813,685,248 possible camera configurations, RED only half-jokingly chides. The brains are built upon Mysterium-X and Mysterium Monstro sensors which start at 2/3-inch and end at a whopping 6x17-cm -- when a new sensor comes out you just upgrade the brain. Scarlet will launch in 4 choices ranging from $2,500 (and possibly less) to $12,000 with a variety of lens mounts (yes, Canon and Nikon) capable of shooting 3K @120fps on up to 6K @30fps. Epic will offer similar mounts with capabilities spanning 5K @100fps ($28k) to 9K @50fps ($45k) -- a 28K system hitting 25fps is expected in 2010 for $55k. Still image resolutions will range from 4.9 megapixels to a freakish 261 megapixels. The first Scarlet systems could come as early as Spring of 2009 while EPIC should arrive by summer. Of course, the brain is just the beginning of the costs. 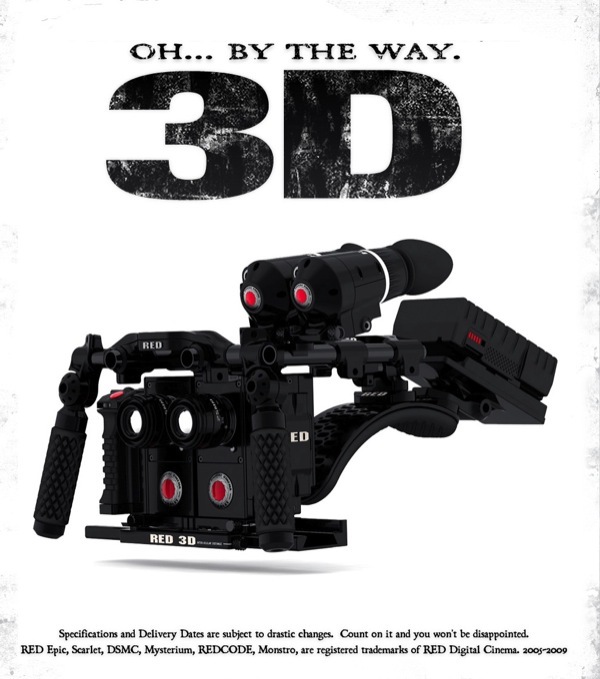 RED also introduced a 3D camera configuration today in true, "one more thing" fashion. See all the details in the gallery below, 3D camera after the break.